We encourage you and your admins and coaches to frequently post to the TeamFeed to keep your team engaged. All admin levels can do this, from Email/Print/Calendar on up. 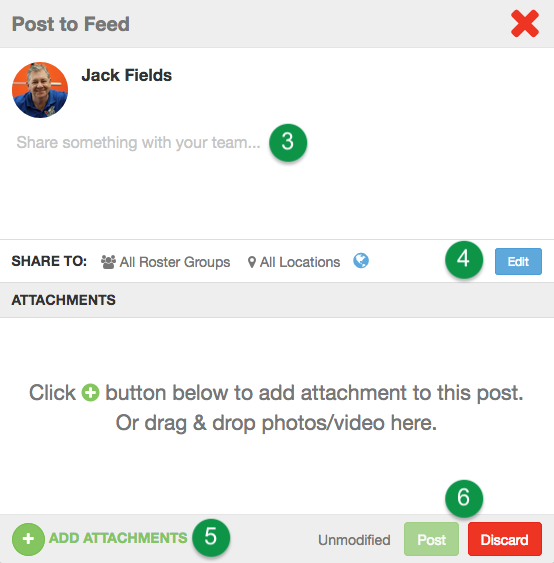 You can add a TeamFeed post in OnDeck or SwimOffice. Navigate to your TeamFeed page—either click the TeamFeed button in the side column, or the TeamFeed tab in the top menu if it is enabled. Click the Share something with your team... field at the top. Click Edit by SHARE TO to set which groups and social websites see your post. If you want to target certain rosters/squads, first set the Share this post as Public? switch to NO, then click in the Roster Group field and select which roster groups you want to tag. Same thing for Location if you want tag certain locations. By default, the Share this post as Public? switch is set to YES so that anyone visiting your TU site to see the post. Click it to set it to NO so that only those who are logged in will see the post, and to potentially target certain Roster Groups (Squads in the UK) and Locations. Click the Facebook switch to YES to simultaneously post to your Team's Facebook page. Same with the Twitter switch. The first time you select either one, you will need to Connect to your Team's Facebook or Twitter page. Just follow the prompts. Once completed, all you will need to do for future posts is tap the Facebook or Twitter switch. Click Settings to change which FB page to post to or to disconnect from the Facebook or Twitter page. Click Done Editing in the upper right when finished with the sharing settings. VOICE NOTE — Attach an encouraging word you've recorded with some other app. Navigate to the audio file and double click it. PHOTO — Navigate to a photo and double click it. VIDEO — Navigate to a video file and double click it. PRACTICE — A list of Coaching Tools practices will appear. Either double click one, or drag and drop it to the ATTACHMENTS area. 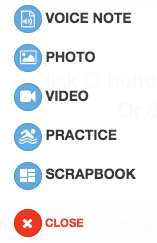 SCRAPBOOK — A list of ScrapBooks you built in OnDeck will appear. Either double click one, or drag and drop it to the ATTACHMENTS area. Learn more about ScrapBooks. CLOSE — Cancel adding item. 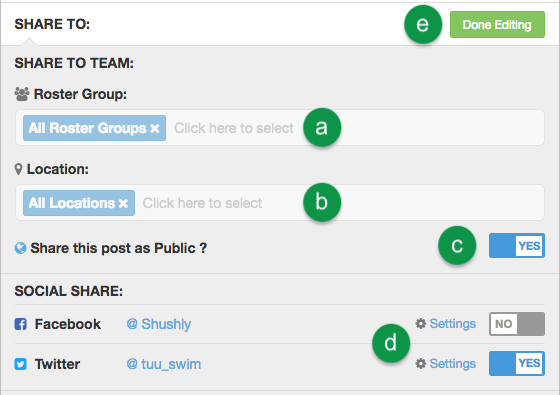 Click Post in the lower right when finished and it will show in the TeamFeed both in OnDeck and SwimOffice. For users who allowed notifications from OnDeck when they installed it, they will see a push notification on their mobile device that they can tap to see the post.